Northern Pygmy Owl from behind, featuring its eye spots. Photo by Gerald Romanchuk. April Fools Day is a human invention that began hundreds of years ago, with uncertain origins. But who are the real jokers here? Animals and plants have been fooling each other for thousands of years – read on to learn how! Prey hide from predators, and predators conceal themselves from prey. This can be as simple as matching the colouration of their environment, or by resembling something within the environment, such as a leaf. This is usually developed through evolution, and not decided on by the individual. A good example is hares, like the snowshoe hares and jackrabbits. They have white fur in winter, and brown fur in summer. Camouflage can include more complicated colours, such as eye spots on butterflies. Eye spots are colour patterns that make a creature look like it has eyes on a different part of its body. In butterflies, these eye spots can have two effects. In one case, the butterfly looks so much bigger, that a predator may no longer be willing to approach. However, sometimes a predator may still be willing to try – but because of the eye spot, they miss their target. Instead of a tasty meal, the predator gets a mouthful of wing, while the butterfly still escapes with what it has left. It isn’t only butterflies that do this, here in Alberta, the Northern Pygmy owl has large fake eyes on the back of its head – it’s always watching for predators! There are multitudes of similar looking species where one is venomous or poisonous, and a nearly identical species is not. Why? Take the harmless Milk snake for example. A group of snakes known as Coral snakes have deadly venom they can use to kill their predators and prey, and they have bright colours to advertise this fact, to avoid injury from predators in the first place. But it takes a lot of energy to create that venom – what if they just developed the warning colours instead? That is what the Milk snakes do. They have the same bright colours, but slightly different patterns than their venomous relatives. After all, who would take the risk? We see this here in Alberta just as often, but with a couple different species – this time with insects. Hoverflies frequently use just the same mimicry technique to look like wasps, and protect themselves from predators. Most predators don’t want to risk that sting! But it gets weirder! 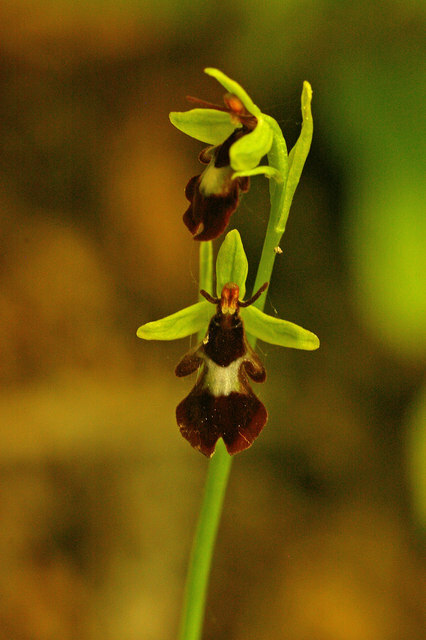 Some tongue orchids mimic the shape and scent of certain species of wasps. What’s up with that? Wasps would not have any interest in this flower normally. But, over thousands and thousands of years, plants that mimicked the scents and image of one species wasp were more successful, because the flower is specifically mimicking the female wasp. In spring when the males are ready to mate, they are desperate to find a female wasp, and fly over and try to mate with this flower! That doesn’t help the flower, but, if that wasp gives up and keeps on exploring, they may find another flower, try to mate with it, and pollinate it, all without that flower having to give up any nectar! Playing pretend: Shorebirds, along with some ducks, will pretend to be injured to draw away predators from their babies. This is called a “broken wing display”. These bird drag a wing and call loudly when a predator is near their young. The predator sees an easy target, and chases that bird, who flies to safety after attracting the attention of the predator, leading them away from the nest or young. 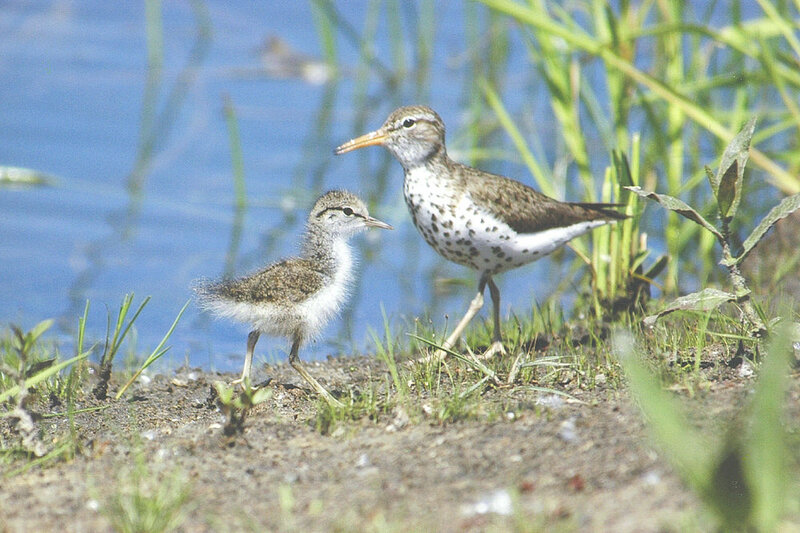 Spotted Sandpiper with young, photo by Betty Fisher. So if you are looking for an April Fools joke this year, maybe take a lesson from nature! For more Fun(ny) facts, visit our Fun Facts Blogs, or click the button below to subscribe to more EALT blogs.